A conveyance of lands or of any estate or interest therein in Nevada can be made by a deed in writing. A warranty deed is a type of real estate deed that can be used in a conveyance of real property. There is no statutory form for a deed in Nevada. In a warranty deed, the grantor warrants that he or she owns clear title to the property and that the property can be conveyed. This type of deed also contains warranties against encumbrances, except for those disclosed to the buyer, and a covenant of further assurances. A warranty deed will, unless specific language in the deed prohibits it, pass the grantor's after-acquired title. 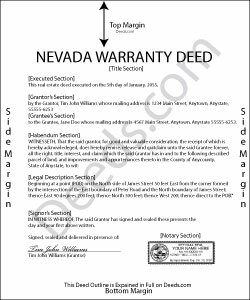 A warranty deed must be signed by the person from whom the estate or interest is intended to pass (the grantor), acknowledged or proved, and recorded as directed by the Nevada Revised Statutes. The proof or acknowledgment of a warranty deed, if proved or acknowledged within the state, is to be taken before one of the following persons: a judge or clerk of a court having seal, a notary public, or a justice of the peace (NRS 111.265). A certificate of the acknowledgment of a warranty deed or the proof of execution thereof, signed by the person taking acknowledgment or proof, and under the seal or stamp of that person will entitle the instrument to be recorded (NRS 111.310). A Declaration of Value must accompany any deed to be recorded. Every warranty deed and every instrument of writing setting forth an agreement to convey real property, or whereby any real property may be affected, that is acknowledged and certified as prescribed by Nevada Revised Statutes must be recorded in the office of the county recorder in the county where the property is located in order to operate as notice to third parties. However, an unrecorded warranty deed in Nevada will be valid and binding between the parties to it (NRS 111.315). After the warranty deed has been recorded, subsequent purchasers and mortgagees are deemed to purchase and take with notice (NRS 111.320). A conveyance of real property within the state of Nevada that has not been recorded as provided will be void as against any subsequent purchaser in good faith and for a valuable consideration, of the same real property or portion thereof, whose conveyance is first duly recorded (NRS 111.325).